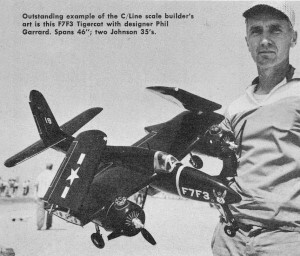 Outstanding example of the C/Line scale builder's art is this F7F3 Tigercat with designer Phil Garrard. Spans 46"; two Johnson 35's . Tiny radio controlled low-winger has 27" span; push rod escapement; .049 engine; weighs 10-1/2 oz. Chuck glider will do stunts. 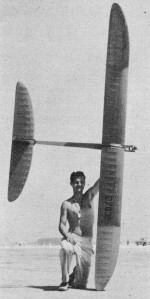 Class B free flight gas model above spans 128 inches, uses maximum size engine, McCoy .60 c.i.d. Just as free flight models have taken on specialized design characteristics, so have control line models. There are highly specialized speed, stunt, racing combat and Navy carrier and scale types. First step into control line flying for the newcomer should be with a simple Trainer. As experience is gained he can then progress to the more complicated and demanding types. C/L TRAINERS - The inexpensive control line trainer kits available today reduce the model to its bare essentials. Nearly all feature profile fuselages. Construction is all solid balsa. Most have wings, tails and fuselages shaped to outline and cross section. 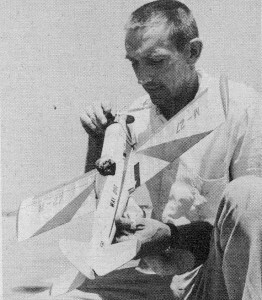 Noses are reinforced with plywood for engine mounting. Everything else - landing gears, control system - is out in the breeze, mounted on the outside of the model. Main parts are easily cemented together and doped. The all-balsa construction makes the trainer a rugged model, able to stand up through repeated hard (beginner-type) landings. Trainers usually are heavy, so they fly slowly giving a flyer a chance to learn proper control handling. Flight performance is limited to up and down and round and round; no stunting, please. Trainers range in size from 18" span 1/2A powered models to larger 30" and 36" span types for .19, .29 and .35 engines. Flying lines can be 20 ft. long Dacron line for 1/2A's and 50 to 70 ft. steel wire for larger models. Unless you are blessed with a smooth hard-surfaced flying site we recommend starting off with the larger models, since their weight and larger wheels enable them to roll easily over rough grass or dirt, making take-offs and landings easier. The little ships can trip up and be blown about readily in any wind. If possible try to get an experienced control line flyer to help you through those first flights. He can stay in the center of the flying circle with you and guide your hand and arm through the proper "up" and "down" control movements. The new flyer invariably tends to over-control so if an experienced hand is standing by he can usually save you from pranging your new model first time out. So if you want to get into control line flying, start with a simple trainer, don't buy a complicated, fancy scale job. The object is to get in on the flying fun, and a trainer will get you there the quickest. You'll have few if any construction problems and can easily learn engine operation, care of flying lines and control technique. C/L SPEED - This highly specialized phase of control line flying is to modelers what drag racing is to car fans. The object is to extract the last ounce of power from engine and fuel to go as fast as possible. At present speeds of over 90 mph are flown by 1/2A powered models and larger engine classes turn in 100 to over 160 mph marks in competition. This is really whistling around a 70 ft. radius circle and is definitely not for beginners. 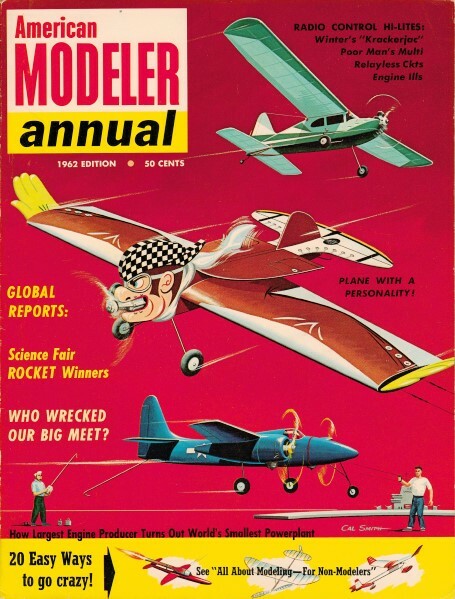 Speed models are flown in four classes according to engine size: Class 1/2A, up to .050 cu. in., Class A, .051 to .1525 cu. in., Class B, .1526 to .300 cu. in., and Class C, .301 to .655 cu. in. One other class, Proto speed, is limited to .1526 to .30c) cu. in. engines; more on Proto later. All speed flying competition has definite rules governing length of flying lines, wire diameter, pull test, size of handle and number of laps to be flown, timing methods, etc. ; see A.M.A. regulations. The basic rules apply to all and have resulted in specialized model design. Construction is rugged and models are built of hardwood, plywood and cast metal parts with very little balsa being used. 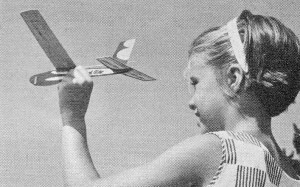 Designs are super-streamlined with very thin wings and the minimum sized airplane is used that will maintain stability and control. Example: A typical Class A .19 powered speed job has about 14" span and length. The biggest, .60 powered have only 20" span. Engines are completely cowled in to aid streamlining. Engines are hotted-up, special fuels are used and small high pitch props let the RPM really scream. Spinners are universally employed, hand cranking is sometimes done but starting is usually with aid of a portable electric motor and storage battery. Electric motor shaft is fitted with a short rubber hose with end open and clear. Model spinner is held into revolving hose and friction turns over model engine. High rpm starting can be hard on fingers.